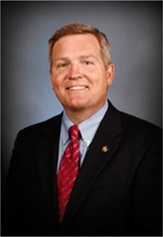 Senator David Pearce (R-Warrensburg) says campaign contribution limits are the most important part of ethics reform, despite many other Republican lawmakers opposing limits. A senate committee is considering Pearce’s bill that would cap donations from political party committees and for candidates running for statewide office. “Right now, the sky is the limit. We’ve seen $100,000 checks, $500,000 checks, $1 million checks. I really think that pollutes the system. To me, it doesn’t matter if you’re Republican or Democrat. It’s good campaign reform and I really think we need it in Missouri,” said Pearce. Several different ethics bills being offered this year include banning gifts and meals paid for by lobbyists. Pearce’s proposal would cap limits at $5,000 for candidates for statewide offices like governor, $2,500 for Senators and $1,250 for Representatives. One largely Republican argument is that there’s more transparency without campaign finance laws. “People have said if you put limits on, people will find a way to get around it. So, let’s don’t do it. Well, you can say that about any law in the state of Missouri,” said Pearce. The full Senate is expected to consider this week ethics proposals passed by the House.